The Arc de Triomphe du Carrousel (architects Percier and Fontaine) was built between 1806 and 1808 by Napoleon I following the model of the Arch of Constantine in Rome. 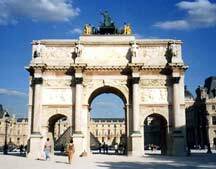 The two arches conceived by Napoleon, Arc de Triomphe du Carrousel and the Arc de Triomphe de l'Etoile, were erected to commemorate his victories, and the grand armies he had commanded. 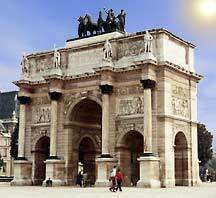 The bronze horses which originally perched on top of the Arc de Triomphe du Carrousel were taken from Saint-Marc of Venice. These were later returned after WWII. The monument is richly decorated in rose marble on the columns and the front paneling. It is part of the so-called Grand Axis of Paris  or Voie Triomphale  which consists of the Grande Arche de la Défense to the west, the Arc de Triomphe de l'Etoile at place du Général Charles de Gaulle, the boulevard Champs-Elysées, the Obélisque de Luxor at the Place de la Concorde, the Tuileries Gardens, the Arc de Triomphe du Carrousel, and the Palais du Louvre (Louvre Museum) culminating at the eastern end. The Arc du Carrousel is composed of three arches: a big one and two little ones. While the principal structure is 63 feet high, 75 feet wide, and 24 feet deep, the ceiling of the big arch is 21 feet high and 9 feet wide, and the two small arches are each 14 feet, 16 inches high and 9 feet wide. The arc is surmounted by a group of men on horses underneath which one finds the names of the battles and treaties of Napoleon. Location: Place du Carrousel, 75001 Paris. Métro: Tuileries, Palais Royal - Musée du Louvre. Bus: 24, 27, 39, 68, 69, 95, Balabus. Text by Lynnise Phillips - Pomona College, USA; Edited by Ian C. Mills, 1999. Source: The Paris Pages (web site). Images: Arc de Triomphe du Carrousel  straight view, looking toward Louvre pyramid & courtyard, from Studio-live.com Fonds d'Ecran (desktop wallpapers), © Artevisio International (a service of VisioArt GmbH); angled view, with Tuileries Gardens to right, from ClickArt Incredible Image Pack 65,000 © 1996 T/Maker Company. All Rights Reserved.